Sandhya Menon has done it again! She has delivered yet another delightful read to warm all the desi hearts. 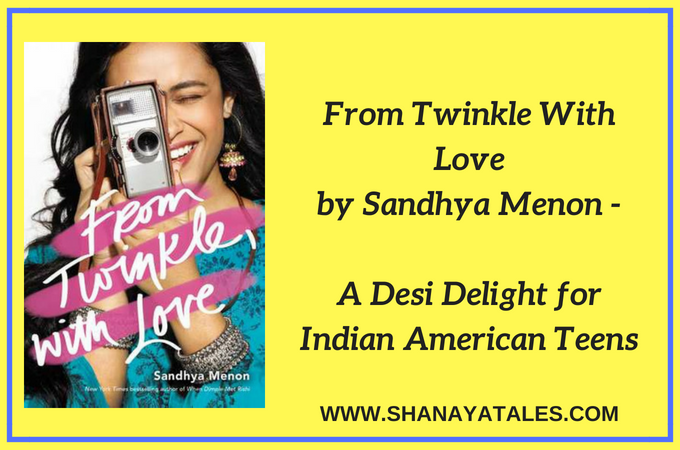 Her second and latest offering, From Twinkle With Love revolves around an Indian American teen Twinkle, who aspires to be a filmmaker, and her story (in this book) is told through the letters she writes to the female filmmakers she idolizes. Which I have to say, while a little disorienting at first, was a pretty interesting format to narrate a story, and I really enjoyed reading it. Having said that, I have to mention here that when I first started reading the book, I was a little taken aback, because From Twinkle With Love reads a LOT younger than When Dimple Met Rishi (the author’s debut), and I guess at first I was expecting a more mature voice, possibly because of her debut, or even the model on the cover who is definitely older? Anyway I got used to it, because Twinkle’s voice is realistic and fits her age group perfectly. And that’s another thing with this author. She is amazingly gifted when it comes to writing these super adorable yet extremely realistic stories. I don’t know how she does it every single time, but on one hand her characters are just like people you will possibly know in real life, and yet, they have this ‘larger than life’ kind of aura (?!) around them that distances you enough to sit back and enjoy the story. Oh and did I mention I ADORED the love story? Because I did. And okay it’s quite possibly because I adored Sahil (Sandhya has mastered the art of writing swoony boys/men), but honestly, even outside of my bias, I loved how sweet, yet realistic their story was. Related: If you enjoy this genre, check out my review of the author’s debut When Dimple Met Rishi. And while we are speaking of realistic, I have to say that in this story, the author has captured the essence of the turbulent teen years perfectly. From trying to navigate the ups and downs of friendships to sorting through the feelings of infatuation vs love to wanting to rebel against everyone, even against better judgement – spot on! Of-course this also meant that there were times when I wanted to get into the pages and shake Twinkle out of her reckless stupidity. But let’s face it, there were times when my teenage self would have needed a good measure of aforementioned shaking too. So like I said, realistic. Having said that, it was truly gratifying to see Twinkle grow and evolve as the story progressed, learning as much from her failures as she does from her victories, and blossoming into a wonderful young lady. All in All: While far from perfect, this one was a SUPER FUN ride. And I’d highly recommend it to everyone who enjoys young adult romance, but I’m sure it will be a super special treat for the desi teens, who should definitely pick this up. That’s all from my end folks. I’d love to hear from you. Have you read this book yet? Or for that matter When Dimple Met Rishi? Among the two, I definitely liked her debut a little better, so I’d recommend you pick that one up first. But honestly both her books are a desi delight for Indian American teens. Disclaimer: I received an Advance Reader Copy of this book through Net Galley, however the opinions, as always, are completely mine. I should read this book before I leave my teenage years behind me. The letter-format of the book does sound interesting! Please do! And I would love to hear what you thought of it! Thats an interesting format. Narrating a tale through letters. Wondering how has the author manage to capture nuances of a teenager, through letters. Honestly it was kinda disorienting at first, but after a while you get used to it, and the narrative flows smoothly. This sounds like a cute read, Shantala. I recall your review of her first novel. They both seem quite sweet. I admire a writer who can create such endearing characters. Me too. Especially because after all the hype her debut got, it was no easy feat to live up to the expectations. The letter format reminds me of Guernsey…… I am not much into reading Indian authors but your review here has tantalised my reading irk and I am marking it to be checked up for later!! Aw yay, I’m so glad this one lived up to the promise of Menon’s debut! I’ve been looking forward to it ever since I read When Dimple Met Rishi, which was a delight. I’m so glad that YA authors are writing romcoms — I really miss teen movies, which evidently they’ve stopped making, and Sandhya Menon’s books fill that holy in my heart. Exactly, that is exactly what Menon’s books do for me. They are simply adorkable! Shilpa Gupte recently posted…Fearless Nadia and The Dragon. I haven’t read the author and i need to check out both the books. Sounds so much fun. Totally in mood for reading about swoon worthy guys and romances. In that case, you should definitely check out this book! I love the letter format – epistolary format, so I am already sold on this one. Loved your review Shantala, your excitement over for a good story is infectious. Hehe, thank you, Tulika. I personally wasn’t a fan of the format in the beginning, but eventually I managed to get into the flow of the story. Thank you. I hope you enjoy the read.